About Ilaria M. Message Ilaria M.
TOUR GUIDE RESPONSE: Thank you Idil! Excellent, knowledgeable guide who was happy to customize the tour to our interests. TOUR GUIDE RESPONSE: Thank you Andreas! Ilaria gave us a fantastic 2 hour tour of Pompeii. I couldn't rate her highly enough, she was great on all facets: knowledgable, friendly, great english, responsive. Excellent tour of Pompeii and the Amalfi coast! Ilaria was very knowledgeable and friendly, would definitely recommend to anyone looking to get the most out of their visit! Ilara's enthusiasm for Pompeii was infectious. We learnt so much in 3 hours and the time passed too quickly. Ilara was delightful to be with and my whole family had the best tour. Thank you so much! We were delighted with Ilaria and her skill in bringing Pompeii to life for us. It was quickly apparent she has a deep knowledge, enthusiasm and understanding of the city and it's past inhabitants. She took us through most of the major buildings and pointed out interesting detail. Ilaria dealt with our many questions with ease and gave us choices about what we wanted to see. As well as understanding the historical significance of the site we also left feeling the terrible impact of the disaster. Superb. Ilaria is an excellent guide. We wanted to return to Pompeii after many years and also see Napoli so she provided a customized tour. We toured some of the newer excavations of Pompeii and they were very interesting. We also appreciated her comments and observations. Afterward, we toured Many of the key places in Napoli while we still had our driver with us. Then Ilaria walked to the castle with us and we stopped for coffee and pastries. A perfect day. Very organized. TOUR GUIDE RESPONSE: Hello Dennis, what a nice day I had with you! I really appreciate your enthusiasm and your interest for my city and Pompeii. Thank you very much for your kind words. Ciao! Illaria was very pleasant and provided the type of tour we asked for, very personal and relaxed. Anthony the driver was outstanding. We enjoyed our day with them and would book them again. I have recommended them both to my colleagues. This is a very good 1-day tour. If you were not a historian, you will need someone to show you Naples and especially Pompeii. Our guide Ilaria was knowledgeable and accommodating. The only regret was that we felt the time we spent in Pompeii was too short, partly due to an afternoon shower, but also the time management. The tour by Ilaria was excellent and we were sorry when it ended. She is very knowledgeable and put up with all our interruptions and answered our every one of our questions. Her English is great and easy to understand. Despite the heat, we couldn't believe how fast the time flew by. Since we could only see a small part of the large site, we plan go back in the future to see the rest. It was a worthwhile investment to have a guide and skip the long lines! 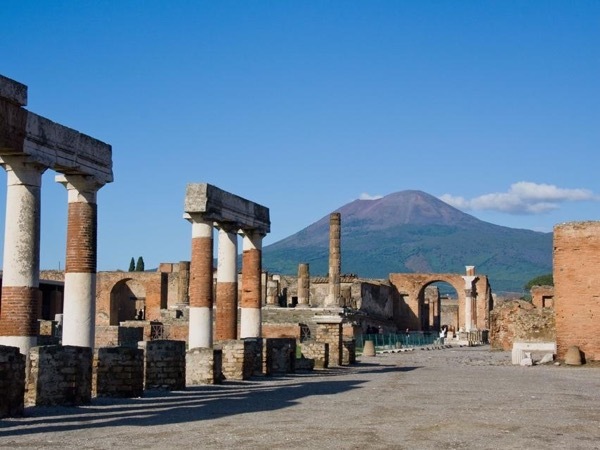 We highly recommend this amazing tour of Pompei. A perfect day experiencing Naples and Pompeii with a group of 11. We had an excellent tour with Ilaria as our guide. Ilaria was fantastic ! She is a very knowledgeable, nice and wonderful guide. Would strongly recommend Ilaria! TOUR GUIDE RESPONSE: Ciao Deena! I tried to show you the best of my city and Pompeii and I'm glad to know I passed on you this passion. Enjoy your holiday. All the best! Ilaria was very knowledgeable and engaging. She introduced to us Pompeii in and entertaining way filled with stories. Ilaria was very accommodating even though we arrived late, she gave us as much time as she could even though she didn't need to. My family learned a great deal about Herculaneum and it showed that Ilaria was very knowledgeable and passionate about the history of the site. If you don't have hours to walk around Pompeii this was a great place to visit and I highly recommend a guide (like Ilaria) to get the full experience. Ilaria was fantastic at giving our family a tailored tour that I, using a mobility scooter, could navigate. She gave us a good sense of the immense town and the people that lived there. Extremely knowledgeable and her English was perfect. Although it was a very rainy and windy day, she gave us a fantastic tour and even made sure we got back to our vehicle safely. We enjoyed her so much that we booked another tour in Naples with her. I highly recommend Ilaria to anyone looking for a guide to Pompeii and/or Naples. She is very knowledgeable, professional, and is amazingly pleasant. She guided us through the crowds in Pompeii, showing us the sights and sharing the amazing stories. In Naples, Ilaria took us on a tour of the historic district. She went above and beyond my expectations. Always happy to take family photos of us, plus she knows some incredible coffee and gelato places. We had an awesome day. TOUR GUIDE RESPONSE: Thank you Glen I tried to do my best and at the same time I had a lot of fun with you! I really hope to meet you and your incredible family again. Keep in touch! Ilaria was a great guide and my family really enjoyed our personalized tour of Pompeii. Since we were coming in on a cruise ship, we asked Ilaria to arrange transportation to pick us up from the cruise port and she was waiting for us with a driver when we got off the ship. Overall, Ilaria was very knowledgeable and friendly. We would definitely book another tour with her. A very special thank you to Ilaria for making our day in Capri so unbelievably amazing for Jack and I. We really enjoyed the tour but mostly we enjoyed your company!!! Until we meet again CIAO!!! Ilaria was a gem! Excellent historical knowledge, very easy to understand,made Ercolano come alive for us. TOUR GUIDE RESPONSE: Thank you for your wonderful words! It was a pleasure to meet you. Come back soon! Iliana was extremely knowledgeable and she presented the information in a well organized manner. Iliana took us through Herculaneum, and was she was talking about something, it was then demonstrated with something we were directly passing by. I would highly recommend Iliana to anyone as the tour time flew by. She was super nice and extremely knowledgeable. Highly recommend!!! Ilaria was extremely accommodating in working with our time frame and emailing us back and forth even before we left the USA. She was very knowledgable and spoke English beautifully. She picked and chose the most and best things to see in each of the locations so as not to overwhelm us but to give us the flavor of the experience. She even allowed us the time to have a picnic lunch in between the different tours and accompanied us on the train home. We would highly recommend her. TOUR GUIDE RESPONSE: Thank you Felicia. I had a wonderful day with you all! Ilaria was incredibly knowledgeable and really enhanced our experience in Pompeii. We very much enjoyed learning about the ruins and the history of Italy. TOUR GUIDE RESPONSE: Thank you Ilyssa I had a really nice time with you! We spent a fantastic day with Ilaria at Pompei. She is very knowledgeable and also have the competence to engage all of us, children and adults. I am highly recommending Ilaria. Our family of 4 spent a fantastic day in Pompeii and Herculaneum with Ilaria. She was kind, enthusiastic, and knowledgeable about the subject matter as well as the logistics of getting to, from, and around the sites. Our 10-year-old was riveted and tells everyone it was the highlight of our 2 weeks in Italy. My husband and I studied ancient history and architecture at the postgraduate level, and we learned a lot too. Our group enjoyed our afternoon with Ilaria. She was very knowledgeable and made the tour interesting for us. She was very accommodating and friendly. We highly recommend her! Ilaria was outstanding. She was very knowledgeable, well educated, clear in her explanations, thoughtful and considerate of me and my family. She is everything I could expect in a guide. Ilaria was a wonderful tour guide so knowledgeable and passionate about Pompeii. We could not have asked for a better tour. We had 6 in our group including 3 children ages 6, 9, and 11. It was fast paced enough to keep the children interested and she had wonderful stories of life in Pompeii. I would recommended the early morning tour there were no crowds and much better than fighting the midday heat. I would recommend Ilaria to anyone who wants a great and informative tour. Ilaria was a fantastic tour guide, my wife and I spent the day visiting Pompeii and Villa di Poppaea with her and enjoyed every minute. She is VERY knowledgeable, enthusiastic, friendly, and accommodating. We had a fun day, learned a about Roman history and the region - she knows all of the best parts of Pompeii, both famous and not, and has endless stories and anecdotes which made the history come alive. We strongly recommend her and will surely hire her again for our next visit to Italy. Ilaria was a fantastic tour guide, my wife and I spent the day traveling the Amalfi Coast with her and enjoyed every minute. She is knowledgeable, enthusiastic, friendly, and accommodating. We had a fun day, learned a lot about the small towns along the way (Positano, Amalfi, etc)- she knows all of the best sites, both famous and not, and has endless stories and anecdotes which made the history and region come alive. We strongly recommend her and will surely hire her again for our next visit to Italy. Ilaria met with us at a local restaurant she recommended, the "Caupona" and we were so glad of her recommendation, because everything started perfectly. As for Ilaria, we both enjoyed very much her knowledge, her passion and she gave us great insights and made sure we were comfortable with the pace. Thanks to her vivid descriptions she made Pompeii "alive" again! My husband and I cannot recommend her enough! Thank you Ilaria for making our day and visit to Pompeii so exciting and interesting. I'd highly recommend IlariaPompeii was fascinating and Ilaria was a great guide, very knowledgeable, and I'm so glad we visited with a guide rather than on our own. Naples ... We needed more time. Next time we will focus more on the Gastronomic delights available in Naples. Ideally I'd recommend a two day tour. Day one visit Pompeii with lunch in the middle maybe more time in Pompeii or to see Erculaneum or a trip up to Visisuveus as an option. Day two eating and sightseeing your way mostly walking. Ilaria was an amazing guide! She exceeded our expectations in every possible way. From her knowledge, personal connection, patience and overall personality, she made the trip to Pompeii incredible. Best day of our Italy vacation! Antonio, our driver was also amazing taking us on a great tour of Naples. TOUR GUIDE RESPONSE: Thank you very much for your review. You are a wonderful family and I really hope to meet you again in your next trip in Italy. Arrivederci! Ilaria was the perfect guide. Immensely knowledgeable, extraordinary English, charming and caring. Pompeii is a wonderful site which illaria brought to life for us. Thank you ilaria... We only wish we had booked for longer than 2.5 hours.